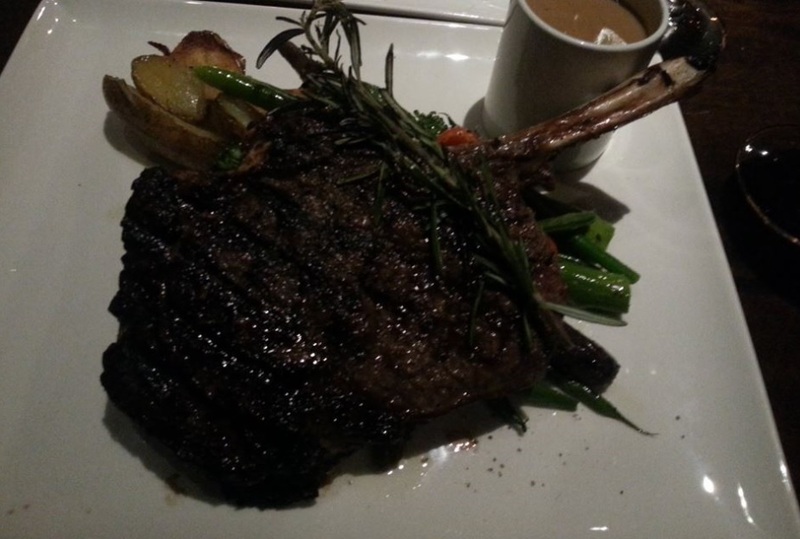 Went to Vertigo Stk bar, a new steakhouse opened in downtown Montreal. The interior of the place is impressive by Montreal steakhouse standards (at the exception of the Queue de Cheval, which, based on the pics posted on their facebook page, seems to boast the most lavish decor of any steakhouse in town), with leather and dark wood featuring heavily. The ‘pictures‘ section of of their web site has everything you need regarding the looks of their decor. Those pictures will show you how pretty the place is (it is very pretty), but it won’t tell you how those chairs were ergonomic (I have rarely seen chairs this thoughtfully comfortable at a restaurant in Montreal). 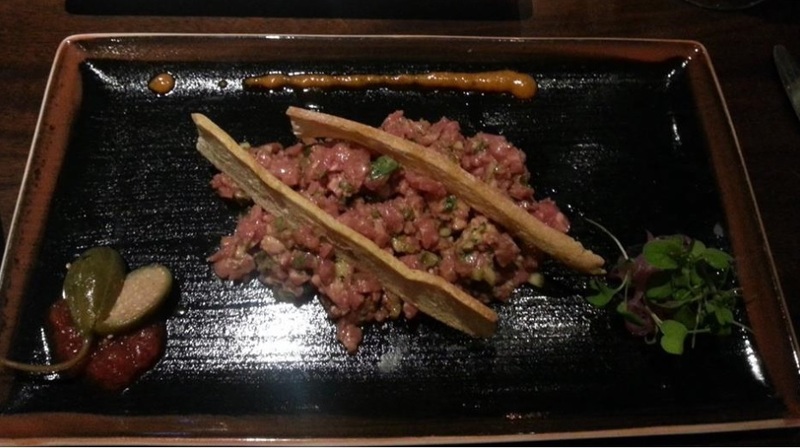 My wife ordered the beef tartare which was all about the quality of the meat: indeed, well sourced. It was hand cut and meat this fresh always make a good impression. Not as boldly seasoned or exciting as one would wish right from the first bites, but bite ater bite it morphed into an enjoyable tartare. 6/10 for me, 7/10 for my wife. 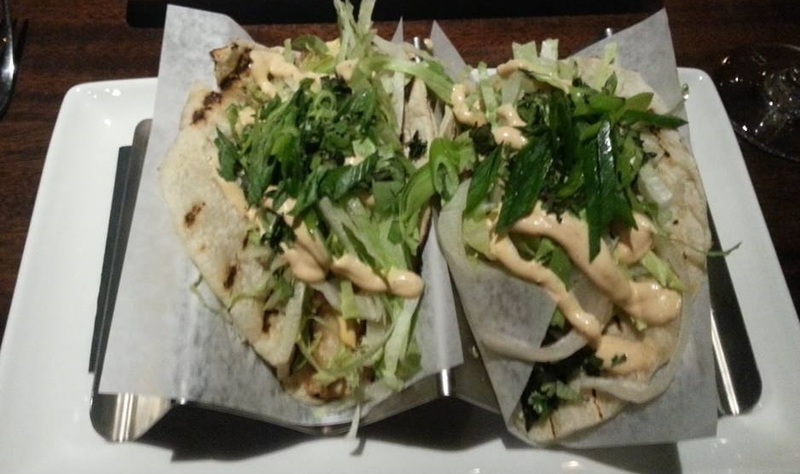 The fish tacos is an item that most online accounts have raved about. It was not bad, but two factors jumped to our attention: (1) the tortilla had a grilling flavor that we –surprisingly — did not enjoy. It was not grilled throughout (more accurately quickly laid on a grill ) , but the grilling flavor’s bitterness was a bit too present…so not pleasant for our palates. Taste is subjective though, so give it a try and see for yourself (2)the fried fish that was in the tacos was of good quality, but the overall was standard/regular/normal western style take on the tacos..nothing more. The problem with tacos is that the Mexican influence is never far away, as we are in North America, so fine tacos is fresh in North American memories – for eg, while eating those tacos, I had the finer ones of El Rey del Taco (in Jean Talon’s market) fresh in mind, and the ones I was having at Vertigo paled a bit in comparison as they did not have the Mexican panache I am expecting from a take on the tacos – 5/10 for me, 6/10 for my wife. I also enjoyed some first-rate fresh pickle point oysters,properly shucked, from Prince Edward Island. These were beautifully sourced bivalves. The only minor problem is that this evening’s accompanying mignonette sauce was sweeter than usual and that clashed with the natural mild briny flavor of the pickle point oyster . Mignonette done this well (this starred the kind of vibrant fresh /exciting acidity that mignonette have long lost at most restaurants because the big majority of kitchen brigades are in auto mode when it comes to execute it. This also revealed that even the quality of the lemon is not overlooked at Vertigo Stk bar ) needs nothing superfluous. Desserts went a notch above the performance of the savouries, with warm chocolate & croissant pudding of flawless execution and fabulous taste (superb classic pastry technique elevated with panache in a way that even the new generations of diners will have their share of fun as,for eg, the pudding felt contemporary -meaning devoid from the heavyness of old fashion pastry — but kept the exciting rich flavor alive, and that was also the case for the crème anglaise). The donuts featuring excellent textures, their apple butter/lemon cream flavor not bold, rather delicately complex, which in itself is a sign of great technical mastery. 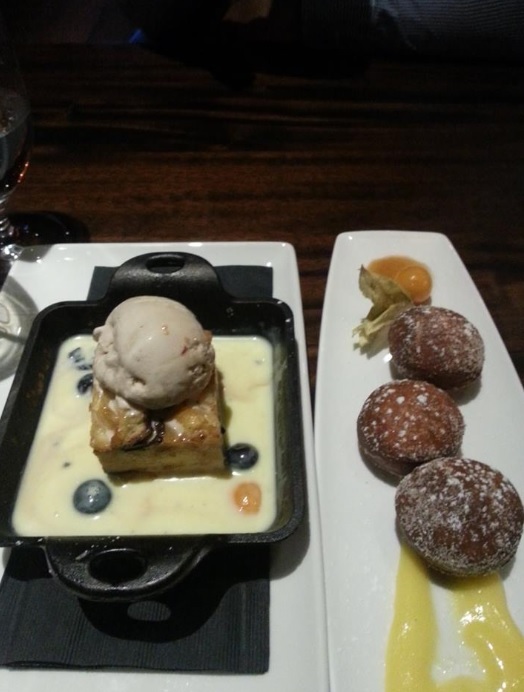 First-rate classically-based desserts. 8/10 in the assessment of both my wife and I.
Pros: A classy steakhouse, a talented pastry team (no gimmicks in its game, but the fundamentals are mastered really well). Cons: (1)This evening’s tacos lacked the bold and joyous flavors of tacos +(2) this rib steak I was having should have been tenderer + (3) wine by the glass at most steakhouses is Mtl is priced agressively. There’s no exception here: 1 glass of a young (2013) red Australian wine (19 Crimes, GSM ), costing $19.95 the bottle at the saq (see here) is sold $17 by the glass of 9 oz …………….. Conclusion: 6/10 , Above average by Montreal steakhouse standards. There are rarely bad rib steaks at a steakhouse (unless the restaurant is really careless about the meat), there are just ones that get close to your ideal of a great rib steak or that simply distance themselves from that ideal. My ideal, these days, is one of a Certified Angus or USDA Prime corn-finished (of course, there’s more to your steak than that, but this is in summary) cut with effect similar to a 40 days dry aged meat. The one I was having on this evening at Vertigo did certainly not distanced itself too much from that ideal, though in my personal subjective and imperfect view, it lacked a bit of the remarkable tender consistency of some other rib steaks I had elsewhere. I’d say that, for my taste, I find that the one at La Queue de Cheval has the edge. Outside of steakhouses, an exceptional Steak shop like Le Marchand du bourg can sell you aged steaks which effect seems, to me, as being even better than what I have sampled at La Queue de Cheval as well as here, at Vertigo. That said, this was an enjoyable steak, the produce well sourced (even the vegetables are not an afterthought), the overall experience very pleasant, with great service, in a beautiful chic and modern interior. What I think days later: The steak did not blow me away but appreciation of steak is identical to judging colors, there will be no consensus over the steak capable to please the most, so perhaps it will fare better with you. What matters, here, is that is a classy steakhouse and it has great potential. It’s obviously not going to be cheap when it comes to feast on their star items, but carefully study their menu and prices (they are available online), resist temptation and you should manage to keep the tab in check.